Our French friend, Beatrice, buys the shirt below for Pippa because a) she finds in her size and b) she thinks it's so perfect for a bilingual English-French speaker. "Je m'en fiche" (pronounced "fish") means "I don't care." But I do care about having the occasional great T-shirt. It turns out that my best Ts about France are not from France. Here are two bought in the US as gifts for me. My friend Sue, who loves Goodwill shopping more than I do (if that's possible), finds the Arc de Triomphe, with children's book character Madeline in front of it, and "Oh la la" written boldly across. And my sister finds me this tiger-T with Paris on, which is doubly appropriate since I am a "tiger" (that is, a Princeton grad). These next two for the children were also not made in France. On the left, "Bonjour Monsieur?" also has the trifecta of Frenchness: beret, bulldog, and striped shirt. Wait! He's also wearing a scarf. It's a quadrafecta of Frenchness! And intellectual glasses! A cinquefecta! This shirt comes from one of our trips to London. Evidently, one must cross the Channel to find the Frenchest T-shirt. The other, with hand-beaded Eiffel Tower, is from the GAP, though I do buy it at a Parisian garage sale. Presumably, it's still there because none of the French people actually want to wear it. But my American/French-ish kids do! !mmed that im asl in cou! It's a poetic French T-shirt, honoring the exotic USA, and I'm sure it says profound, existential things on it that would make Camus proud, if only I could read it better -- or if I were just a little more French. Raclette à la Moutarde is a high quality cheese, specifically made for melting and scraping onto potatoes, bread, sausage. But this Raclette is unusual in several ways. It's pasteurized, yet still very high quality. Also, though most people think of Raclette as an Alpine, almost Swiss, cheese, this one is made in Lot et Garonne of the Aquitaine part of the Aquitaine-Limousin-Poitou-Charentes region. Even when not melted and scraped onto your favorite form of carbohydrates or meat (or, if you're American, broccoli. Gasp! 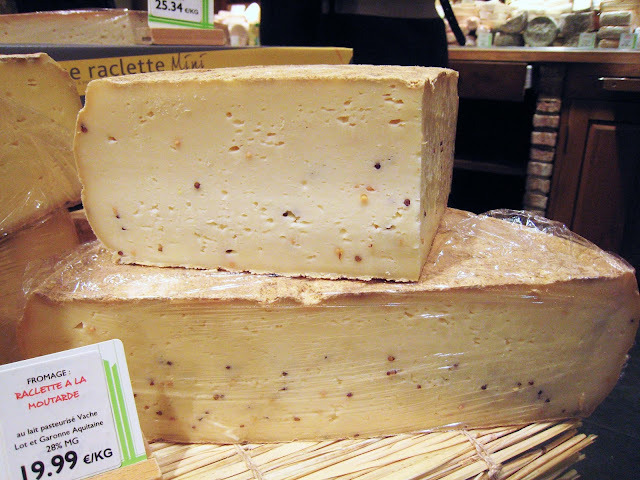 ), Raclette is a fine cheese to eat, creamy, sweet, nutty, stinky, and the case of this mustard version, also with a little kick. But there's really not much reason to eat it cold, when you could be melting it and eating it all oozy and goopy. Like this T-shirt, the Raclette à la Moutarde is a trifecta of Frenchness: it's a Raclette (one of the Frenchest of cheeses, though also one of the Swissest of French cheeses), it's "à la" something, and that something is mustard (think Dijon). But why Raclette à la Moutarde for this story? Quite simply, Raclette à la Moutarde has more Ts in it than any other cheese on my current list. Other than the 3 Ts, for a story about Ts, this connection doesn't make much sense. But then again, neither do some of the T shirts.